Just FYI, I added a photo of my father and me to my first blog. 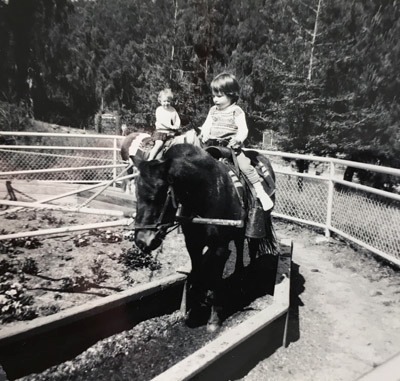 Since my earliest memories, I've had a fondness for horses, as well as for the wilderness. For many horse people, the two go hand in hand. It does for me. Here is my first horse (the pic on the left). My parents would play classical music on the phonograph and I'd pretend I was riding through the Grand Canyon or someplace similarly wild and dramatic. Must've annoyed the hell out of everyone with the constant squeaking of the springs. I really went to town on that thing. I remember it well! 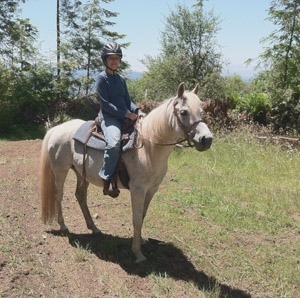 Occasionally, I got to ride a real horse. I believe this was taken at Tilden Park, Berkeley, CA. 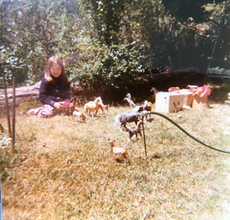 I had my own herd of horses, even though they were plastic. When I was 11, my mother remarried a man from Montana. We took trips to the 'Big Sky' country to see my step dad's homeland and family. Lots of natural beauty, wilderness areas and horses. I was thrilled. The drive there took us through the Rocky Mountains. We visited Glacier National Park. It was amazing. Every now and then on those trips, my step dad would say, 'I'm going to see a man about a horse' and, decreasingly hopefully, I'd think, 'maybe he really means it this time … '. 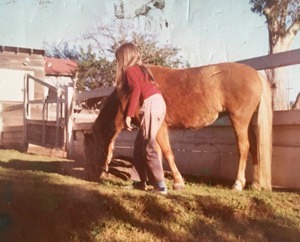 However, it was my step dad who finally helped me acquire my very first real horse. We built a corral together and a larger sort of pasture area (can't really call it pasture since this was in a redwood forest). The picture here was taken where we purchased her. I rode this little gal all over the hills. There were many trails through woodlands and meadows. I rode with friends, but often I rode alone. I loved it! 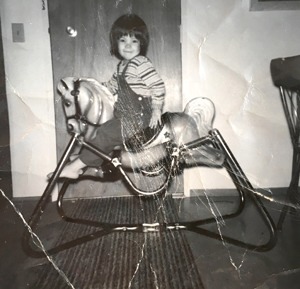 As an adult, I did not own a horse until I was almost 50. I did not have the means and I was busy in college and working and doing so many other things. Sometimes life is like a big fair and you want to go on all the rides. Alas, as one person, that's not really possible, not for most of us. But I did return to horses. Below here is my dear sweet Wally - beloved family member for eight years now. I ride occasionally with a friend or two, and I do enjoy that very much, but usually I ride alone. When the only sounds I hear are the wind in the trees, birds, insects, perhaps a burbling stream, and my horses softly plodding hooves on a dirt trail, I am truly happy.